The United States Constitution has many 21st century impacts on our daily lives that are almost never thought about. At a time of growing federal regulation of our lives, there remain areas of life where the 10th Amendment, reserving power to the states is alive and well. The nursing profession is among them. 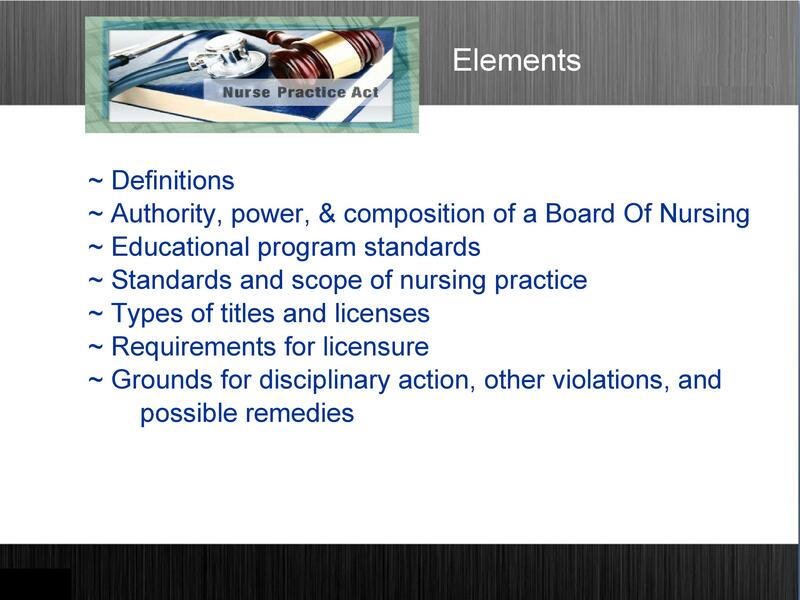 Due to the 10th Amendment there is no federal law of nursing. The states regulate nursing through state adopted nurse practice acts. In the United States, state governments make laws for the people within their borders with power granted by state constitutions. Simultaneously, the federal government, by virtue of the Constitution, makes laws for all the people in the country. The concept of different governments having authority over the same territory, but different subjects is called federalism. The idea of American Federalism is to protect freedom by limiting each government to its own area. The federal government was designed to have only the powers listed in the Constitution, with any power not listed left to the states. 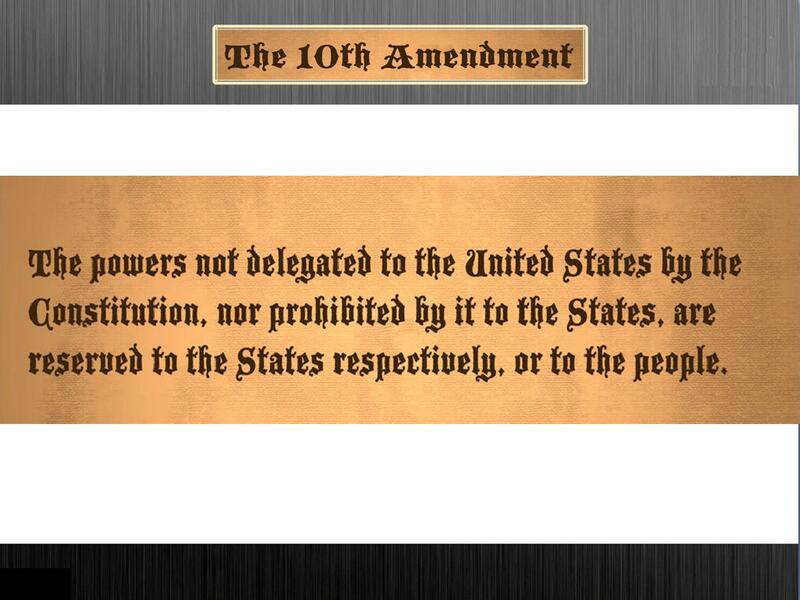 The Tenth Amendment was included to make this clear and to limit the federal government from overstepping its bounds. The United States Constitution does not grant Congress power to regulate nursing. 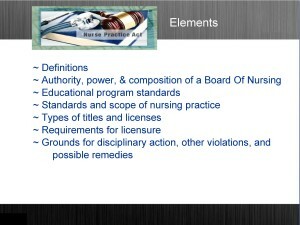 Therefore, the power to regulate nursing is among the powers reserved to the states. 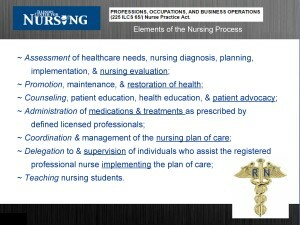 This regulation has its foundation in the Nurse Practice Act. States regulate nursing as one of the health professions that poses a risk of harm to the public if practiced by someone who is unprepared and/or incompetent. 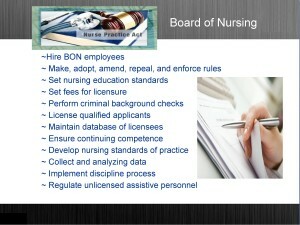 The principal basis for regulation is a state’s Nurse Practice Act (NPA). The NPA sets forth the requirements for the board of nursing, education, licensure, scope of nursing practice and discipline. 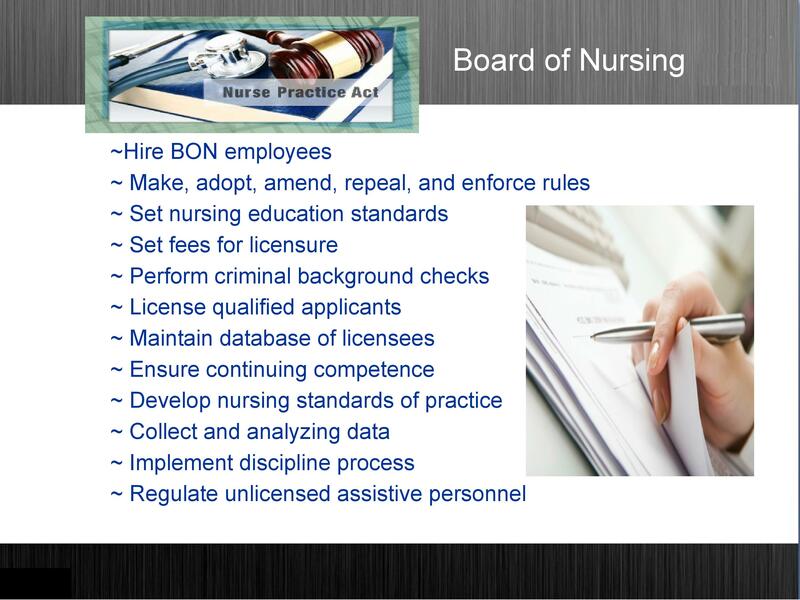 The professional conduct of a nurse is directed and measured by the NPA and rules issued by the Board of Nursing. 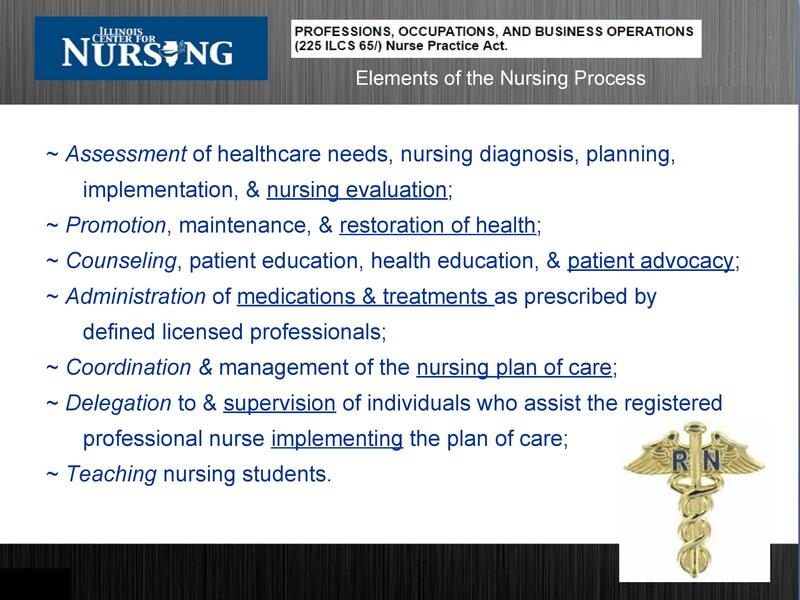 The standards and scope of nursing practice within an NPA are aligned with the nursing process. Each state, through their own Nurse Practice Act licenses and oversees the conduct of one of the most critical components of our health care system. 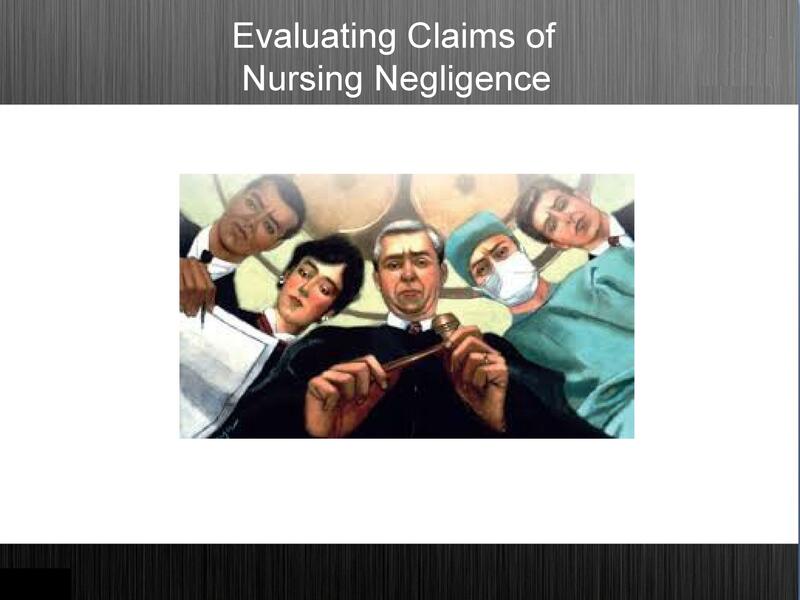 In the rare cases of allegations of nursing malpractice that arise in federal court, a nurse is judged by the standards of the state that licensed her. Even a nurse working for the Veteran’s Administration is held to the standards of her state. This is because there is no federal nursing law, due to the appropriate deference to the 10th Amendment. States frequently update their Nurse Practice Act, and in doing so have the benefit of the experience of other states in this area. This is how the state laboratories of democracy are supposed to work in the federal system, to the benefit of each state’s citizens. Nursing is consistently viewed by Americans as the most respected profession in the nation. Certainly part of this is because of the people drawn to such caring and compassionate work. Another element is the local control without regulation set by a distant government in Washington. 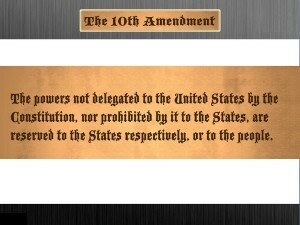 It is an example of the 10th Amendment working as intended. An example of this process is the Illinois Nurse Practice Act 2018 sunset provision. This means an entire review and update will take place in 2017.